Welcome to our first "Latest News"! Welcome to our first “Latest News”! We would like to keep in touch with you on a regular basis to let you know what is happening at Team. We are continually evolving our services and procedures to enable us to provide our customers with the highest levels of service. You will find information on how we are improving our business along with new services we have on offer, new vehicles, our sponsorship programs, safety updates, technology developments, staff and driver announcements, awards and milestones and most importantly just keeping you up to date with our Team at Team! Part of this new information portal on our website is our official facebook profile page! Visit us, select ‘like’ to stay up to date with what’s happening within our business. We have recently purchased three new Kenworths which are K408 550 hp which we use to tow low loaders and dollies. Our Heavy Haulage & Over Dimensional capabilities with our existing and new vehicles allows us to carry up to 70 tonnes on our fleet of low loaders, floats, extendables, pilots, crane trucks & tilt trays with local access to equipment of up to 300 tonnes capability. Two new DAF 8×4 crane trucks fitted with Palfinger 3280 remote control cranes will help Team Taxi Trucks service Energex and be available on our general fleet. Introducing a beast of a forklift to our fleet is the Linde 358 series H160 with a 16000 kg capacity. We are currently doing a lot of Sandstone movements (blocks up to 12 tonne) which are picked up from quarries at Helidon and Warwick on our b-doubles, transported back to our depot and packed into containers and delivered direct to wharf for export. We are capable of doing it all. 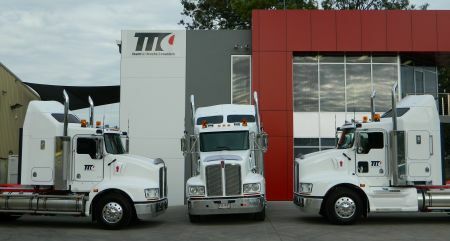 Team Taxi Trucks leads the way in safety, diversity and distinction. The majority of our staff and drivers are ‘long termers’. We have some old fashioned values that go a long way, our esteemed employees are proof of that. Click here to visit the Current Positions page.